Deals based on any customer attributes – name, DOB, etc. Use customers' account information to find out what customers want. Create Magento special offers based on order history to make customers fall in love with your store and regularly come back. Using personal info you can make customers think that you know their needs and wishes. Provide exclusive deals to customers to show you care about them in a more special way. Nowadays it's essential to bring up devoted customers. Competition is high, stores must stick to customers and do everything possible to retain them. The extension is the outcome of real-life requests we received from our customers. You have an ability to sell the most expensive products giving a discount to an additional cross sell product. People like to buy a lot of stuff for less money. Now you can also exclude products with special price from your discount programs. Such items are already discounted to the minimum, so make discount rules skip such items not to lose money. The module allows you to massively ignore products with special prices and exclude all of them from discount rules. From now on there is no need to enable this option for each and every rule; save your time and be sure that all loyalty programs are set to the optimum. 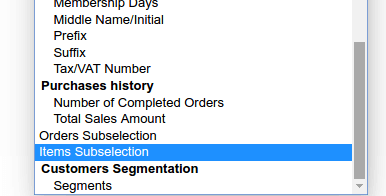 Specify total sales amount or number of orders among conditions. So you can have deals like '15% discount for customers who had placed 5 or more orders' or '$50 discount for clients who bought more than $500 worth of products before this order'. This will motivate customers to regularly get back to your store and place more orders. new! Now it's possible to create conditions based on the number of products a customer has bought before. For example, you can specify SKU or an Attribute Set to apply the rule only for a few items. The extension adds a number of new conditions which you can choose at the 'Conditions' tab, when creating shopping cart Magento price rules. 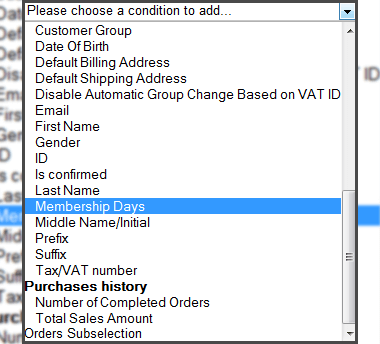 Now you can set email, first name, last name, date of birth and any other customer attribute as one of conditions. For example, you can create a promotion, which will work for all people called Valentine on St. Valentine's Day. Or give 10% discount to people with 'goodsite' text in their email. What's more, attributes created with the help of our Customer Attributes extension, also can be used for creating discount conditions! Let’s say the customer created a number of orders which were later cancelled. 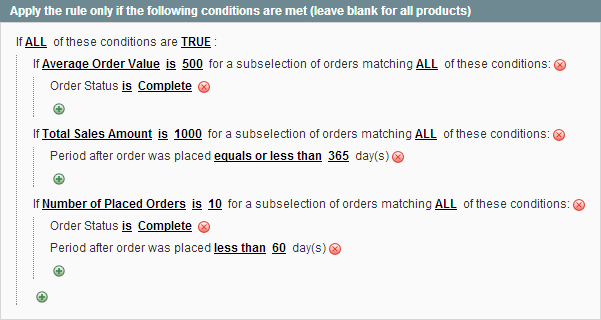 With this functionality it’s easy to count only complete orders to give a discount for a customer. If you have the products with custom options, you can create conditions based on custom options. For example, you sell the cups in your store and there is a custom option to have an engraving for it. Now you can make the promotion rule apply only for the cups with engraving. Inform customers about special promotions you have by catchy promo banners. There are flexible settings at your disposal: it is possible to enable or disable a promo banner for each rule individually. You can place it on top of the page or after the product description. Moreover, you can display banners, depending on the product SKU and category. For example, you can create rules like 'Buy One Get One Cheapest (or Most Expensive) Free', 'Buy 4 products, get the most expensive for 50% off' and so on. Motivate your customers to shop more! Create attractive promotions using deals with additional items for fixed price, with discount or for free. 'Buy X get Y with Fixed Discount' – for example ‘Buy a pair of shoes and get 10 pairs with $15 off!’. These actions work with simple and configurable products. You can select products which are discounted (by whole categories or just individual items) and the products which trigger the discounts. Discount product prices to a fixed amount and have promotions like 'Buy a shirt and get another one for only $10' or 'All socks for just $5!'. With the extension you get a new 'Each N-th for Fixed Price' action. The action lets you discount price of any item to a fixed value (considering that the product meets the conditions of the price rule). For example, you can create promotion 'all contact lens for $20', 'buy a pair of shoes, get another one for $30' or similar ones using this action. 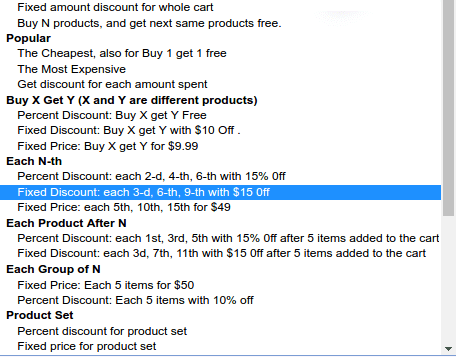 The extension adds 'Each Nth with Discount' rule, which you can utilize to offer deals like 'Get each 5th product for free (or with discount)', 'Buy 3 products from a certain category and get one of them with 40%/50% discount (or for free)' - offer a kind of tier pricing based on category or some other attributes (e.g. attribute set, manufacturer, etc). The module goes all out in support of virtual items. So if you’re the owner of virtual products store you can use all the benefits which Special Promotions Pro offers. easily delete demo rules or invalid coupons which are no longer needed. With Promotions Manager and Special Promotions to create a promo and attract new customers to your store is as easy as it can be. Specially priced items are already cheap. Applying discounts to them in most cases means that you will lose money on such products - now you can prevent this. The extension enables you to skip products with special prices created with Catalog price rules as well. The extension is fully compatible with native Magento conditions. So it is possible to impose limitations like category or sku and so on to create rules like 'Buy more than 1000 worth of products and get the most expensive item from "gifts" category for free'. The savings people make are a powerful factor when considering whether to buy or not (and also whether to keep coming back or not:-). So let’s present the facts in front of them in an easy to understand way, as very often customers want to make sure they get all the discounts they are promised. Now you can display the list of discounts with products that are being discounted. For example, they will see: 'Get each 2nd phone with 50% discount: HTC Diamond -$375'. The feature works starting from the CE 1.4.2 version. We are forever being asked by our customers something like 'Well, now we've got our promotions, how do we shout about them?' The answer is our Product Labels module. 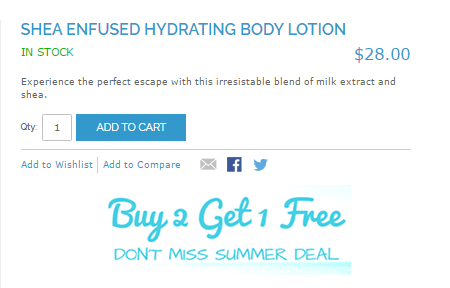 It enables you to add colorful badges to images of products, which make the promotions easy to spot. Of course you can use both custom texts and images for the badges. Great solution for promoting deals is Promo Banners module, which allows to show banners on shopping cart, category and product pages. This smart solution enables you to show banners in appropriate situations and not irritate customers. E.g. you can tell customers that if he will add one more item he will get 20% off. Admin user can define what price will be chosen as a discount base for the action – a special price, the price after previous discounts or the original item price. How to set up the promo 'Buy N products, and get next same products free'? To launch the promo where X is not equal to 1, you need to make changes in the 'Update prices' section: select the corresponding promo action, specify 2 as the 'Discount qty step' and set the discount amount to 1. How to create a rule for specific products? A rule for specific products can be created in two ways. You can generate it either by using corresponding products SKUs or by creating a hidden category for necessary products. Follow the complete answer to see more details. How can I set up a percentage off everything? To set up percent-off promotions on everything you'll need to create the corresponding Cart Price rule with the "Persent of Product Price Discount" action and set the discount amount. See the screenshot to configure the rule correctly. How do I set up a percentage off one category? Using the Magento promotion module, you can easily set up a percent-off sale by creating a Cart Price rule and applying it to a necessary product's category only. To see how to designate 20% off a category, follow the link below. How can I provide a percentage off specific products? 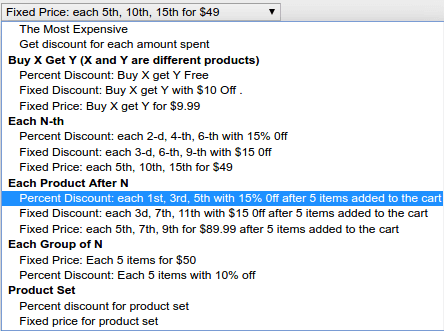 To run a percent-off discount for some specific products you should create Cart Price rule and apply them to a required product only. To see the settings for a 20 percent off discount, read a complete answer. How can I create Fixed Amount Off promotions? With the Magento discount extension, you can create relevant Cart Price rule with 'Fixed amount discount' action. To see a 10-discount-amount example, follow the link below. What is the difference between Conditions and Actions? 'Conditions' establish when your promo will be put into use, whereas 'Actions' specify all the benefits a customer will achieve if meeting all the promo conditions. While combining both the features you can design a vast number of various marketing campaigns. To learn where to configure the setting and how to make it properly, read the full answer. Does this extension have all the functionality of Special Promotions module? Special Promotions Pro is one of the most full-fledged Magento promotion extensions. Besides the additional 5 marketing deals, it offers deals based on customer order history and attributes. To see a comparison chart, follow the link below. What is the difference between Special promotions Pro and Loyalty Program? These extensions have an identical set of rules actions, however the Loyalty Program extension has additional features that help to set up loyalty program levels, count user statistics and display it in the user account. The action can be used for launching such promos as 'buy 3 and get the cheapest for half the price' or 'buy 6 and get 2 cheapest items for half the price'. However, you need to know the rule can be applied to the same categories only. To see a step-by-step action guide, follow the link below. Great extension and awesome support! This extension have a tons a features. Have to try them all! and the support center is fast and so good! We have been using this extension for some months and it\'s working good. We have been using this extension for several months and it's working good. Support is particularly responsive and helpful. Great company, great code! Great all time extension and extremely practical for an online store. Support is excellent. Timely, patient and always pleasant and friendly. One tool for hundred promotions, yep - this one is exactly what we were looking for. It smoothly installs and is quite easy to configure. I wish I found it earlier, as now this app has replaced 2 addons and seems to be even more useful. Great extension, great company, great support! I've bought many extensions from Amasty, including this one. Each and every time i am never deceived by the quality and functionalities of the extension, it always work great, as described. The team is awesome, when i have a question, or problem of compatibility, they solve it very fast. Je suis heureux de voir que l'extension fonctionne comme décrit. Et il est vrai que le module est un booster réel des ventes. Le module est pas très cher, mais je souhaite que je peux l'acheter à un prix inférieur. Great extension, even greater support! We were looking to broaden our promotions because Magento defaults were not fitting our needs. Our development team suggested this one and it has worked well for us. We are no experts in regards to Magento so their support has been a godsend! The only tricky part is the conflicting time zones, as we are in the U.S. and they are in Belarus. So the window of time takes getting used to. All in all, the extension works as described. Keep up the good work guys! Absolutely awesome extension with the ability to add super-targeted promotions. The kind of promotions I love most is the ability to give discounts for the first order as well as for particular amount of orders. This technique works well for increasing sales in my store. IMHO, you'll need some technical background and overall understanding of Magento system to use this extension without breaking a sweat. Another alternative is to email Amasty and ask them to configure the settings like I did. Anyway, this app will help you achieve many promotional goals once you manage to cope with it. I had some troubles with getting the module work with my configurable products. Who knew that each simple product should be assigned to the category of its parent product if you create category-based promotions?The support gave me a hand in understanding some peculiarities, so thanks. At first I was considering buying a non-pro version of this app. But an ability to give discounts based on orders quantity and membership period are really attractive. Now I use this extension as kind of loyalty program for my customers. I faced a few bugs over the last few months and each time I contacted Amasty support, I received prompt and useful answers. This extension is brilliant once installed in a proper way. We tried to do it without help but had to send a support ticket. They responded and helped us very quickly. Right after implementing the module we noticed a significant growth of conversion rates. The results are almost immediate and really impressive! Good job, Amasty, keep it up! Our discount program showed itself to be more powerful with the help of this extension. We set up a bunch of different rules like ‘Buy X and get Y free’ and ‘Buy A and get 30% discount for B’. The outcome is great: we sold out our collection in no time and now we are getting ready to another wholesale. Customers feel happy and leave good reviews, revenue goes up, and all of this with the help of one module. I definitely recommend it to all store owners who set up discount events on regular basis. The module itself is ok, I'm satisfied with its functionality and clear documentation. But now I realize that it would be enough for me just to purchase lighter version (I mean special promotions plugin) as the difference between them is hardly seen. As for the settings, I didn't manage to configure everything I needed without bothering their tech support, but should admit they replied me instantly and helped with the plugin configuration. I'm new to Magento, that's why (maybe) the module's configuration seemed a bit complex to me. It would be great, guys if you added a detailed guide for all possible promotional rules (settings plus examples). As it took me too much time to polish the sets the way I needed. Nevertheless, I'm quite satisfied with the mod as it does everything that is mentioned in the description. Due to instant help of the support guys, I setup all promotions within a couple of hours. They patiently listened to my endless questions (as I found it too difficult to configure all the settings) and carefully adjusted the plugin according to my store specifics. Since than I haven't faced any issues with the plugin. Marketing is one of our top priorities and it includes promotions. Before looking for a promo tool we set our expectations and listed promotions types we need. Then we found a few plugins that seemed to suit us and chose this one at the end. We already have customer attributes from amasty so this promotions extension is a good addition to it. We have about 20 different rules. I had some problems setting them right but received efficient help from their support and managed to set the needed rules. Worth the money. It encourages customers to purchase more and spend the money with positive attitude. The extension itself is easy to use and very customizable. We ran into some problems during the installation process. Something didn’t work out right with our heavily customized theme. Support was one ticket away. These guys fixed it all up in no time and gave us detailed recommendations on how to use the module. Now it just rises our conversions with no issues. This is one of the most satisfactory extensions I've used. Everything is documented properly and works out of the box. It helps our promotional program run effectively with not the percentage of discount offered and free gifts. Setting up rules is very simple, so we can quickly try different offers to find the very best solutions. It’s one of the most effective sales-booster we’ve ever tried! An offer to buy something and get something else with a big discount or even totally free is a great motivator for customers to purchase more and come back to the store. Different sets of conditions and types of rules lead to impressive results. The outcome is almost unbelievable! Thanks, Amasty, you did a great job! 1. Please add grand total to conditions. 2. The difference between special promotions and the pro version is actually very slight, the pro version allows you to use the previous purchases and customer attributes in conditions, as far as I know, that's all. But I needed these features, so. This is a very powerful extension, lots of possibilities for promotions. I needed a small extension customization for my store, and they did it cheap and fast. Thanks to Vitaly! I was interested in this module because of its range of promotion rules. Most of all I liked the capability to make promo basing on number of completed orders and total sales amount. Applying them in my loyalty programs I’ve already succeeded in creating a small core of steady byers! At first the settings seemed to me a little bit complicated. But all times I asked Amasty for help to set up a promo rule they always gave me a hand. Now I feel free to do it by myself. I really believe this module can bring my store to the next stage. I give 5 stars! This is a company I would recommend to Magento newbies. As I previously worked with different CMS I had little experience with Magento promotion rules. I dared to ask how to get the result I needed, and I got an answer in an hour. This experience is very different because I bought a couple of modules from another company, the modules were as good as Amasty ones, but the only reply I've got about the settings was 'go read the manual'. So thanks for guiding me through the settings. I'm very grateful you support inexperienced users. Like this extension in work. It's running smoothy, no bugs and conflicts. Thanks a lot for your products and quick support! I have three extensions made by Amasty and all are superb!!! It is remarkable what you can do when you can create rules that use custom attributes. We have many suppliers that each have their own shipping charges, and this module when bundled with Ship Rules allowed us to create calculated and flat rate shipping charges that always calculated the right price! It is exactly what we were looking for and have not looked back. When we did have a problem they even debugged it and let me know what module conflicting and fixed the issue! Easy to install, does exactly what is required, installation and configuration documentation is easy to follow. 5 stars. I recently purchased your software Special Promotions Pro and I love it. Its perfect for the types of promotions I want to run. One of them I'm running is 20% off for active military people who have a .mil email address. Installed this extension couple days ago and absolutely happy with it. Works like a charm, gives so many possibilities! Support team answers and helps very quickly. Great extension, does exactly what we need it to do with so many possible variations. Support is second to none and very helpful! – Added new condition in Condition section - "Subtotal Without Special Price"
– New code structure to provide flexible options to customize discount logic. – New action: fixed price for product set. For example "buy mobile phone, memory card and the case for $99 in total"
– New action: percent discount for product set. For example "when buying shoes and jacket together, each item gets 10% off"
– Code refactoring. Fix for some payment methods and wrong invoices generations. – Ability to use any customer attributes in conditions section, including the ones created with our Customer Attributes module. – New action 'All product after N for Fixed Price'. Let's you create specials like 'Buy 4 shirts for full price and get each additional one for $20' or 'Buy 5 items and get each additional one for $100' and so on. – New action 'All product after N with Discount'. Enables you to have discount rules like 'Buy 3 chairs for full price and get each additional one with 20% discount' or 'Buy 2 books for full price and get 2 more with 50% discount', etc.